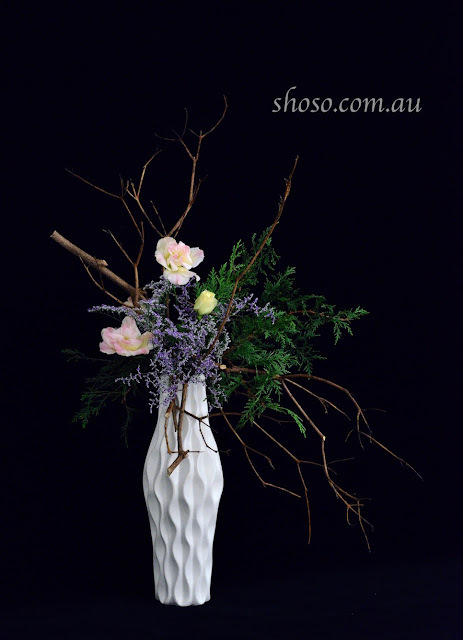 Shoso Shimbo teaches 2 types of Ikebana courses in 2016. Which course is the best for you? This class is available for anyone (not just for RMIT students) and will take participants on a journey to explore the theory of Japanese aesthetics through practical exercises. Ikebana is an entrance to learn various aspects of Japanese arts including gardening, architecture, painting, food presentation, our Tea ceremony, Kimono designs and varieties of our sculpture. 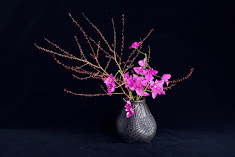 The course starts with a couple of Ikebana lessons to learn its basic principles. Then participants are introduced to various projects such as branch sculpture, wire sculpture, paper sculpture, collage and abstract drawings. Each lesson consists of a video viewing on Japanese art & design, analytical discussion focusing on one significant Japanese artwork and a practical exercise/project. This course is for those who have no experience in Ikebana as well as for advanced Ikebana students. In particular this course is useful for landscape designers, graphic designers, interior designers, fashion designers and sculptors. This is for both a novice and those who intend to obtain teaching qualification in Ikebana. Please visit our Tuition page for details. We can organise an Ikebana workshop on your special occasion such as a hen’s party or special birthday.